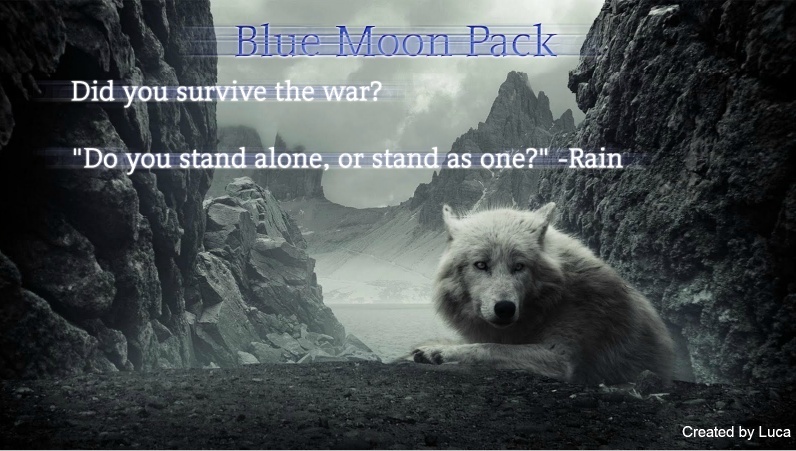 Welcome to Blue Moon Pack! If your new, and haven't registered yet, please read the rules before making an account. Follow the rules, or else... I'll find you! If you are familiar with the Blue Moon Pack, and have already created an account, what are you waiting for? Log in, and explore! Did you survive the war? Do stand alone, or stand as one? Weather: A cool breeze flows within the trees. Above, a dark sky covers us, with a full moon. Our first RolePlay plot has started! A new species (like the Hunger games mutt) bothers the territory, and threatens us! Will we survive the attack? Also, vote for us! Find the link in the affiliation box! Remember to post on the WolfQuest thread link! This is where most of the action begins, and where most pack activities are held. The Woods is where we hunt out deer, and where you can explore! This is on the border of Colorado and Utah. Although this is where the Woods are, we do most of our hunting here, because vegetation is everywhere, and that means deer! The River: Great for relaxing in the shade, or exploring. Bears, and lone wolves are a big threat because of the rivers natural beauty. A beautiful wildlife scene, the Rockies is where the meetings are held. This is Utah, part of our territory. This is where the scouts are most needed. Also, for pups, it's a great exploring opportunity! This is where the Blue Moon Pack was inspired by. Check out the history to understand more. 4 247 Make A Lie! 2 239 Make A Lie! This is where your allowed to advertise your pack. Please do not force members to join your pack.